I'm the local computer expert. I think when you know html and css and webmaster stuff, there's a general assumption you're a computer expert. My wife is always pimping me out to her friends who have PC issues, and I'm forever supporting the family with their computer ailments. Here's a webcomic from xkcd that's pretty spot on. Now you can be a computer expert, too! Since I know encryption, foresnics and virus things, everyone I know thinks I am a "computer guy". I do exactly what is described above. My wife pimps me out too. I'm a Computer Engineering who graduated from an accredited engineering program, AND my job is Software Development. 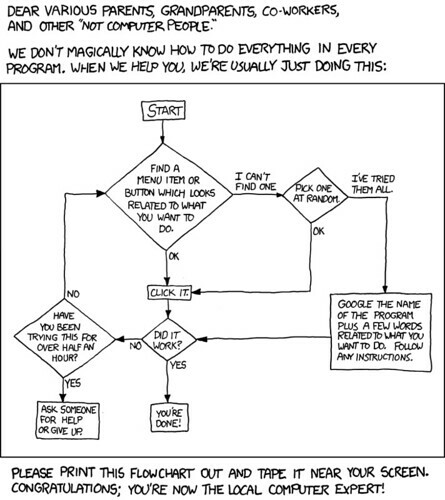 Yeah, I pretty much follow the flow chart as well.